Conner’s union, American Federation of Government Employees (AFGE) Local 2437, fought back. After filing a grievance and demanding hearings, it got the discipline reduced to a 14-day suspension without pay. 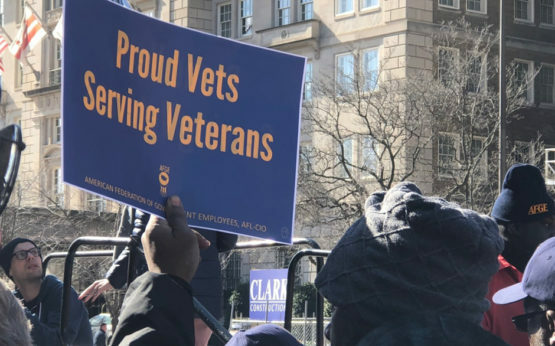 The GOP Trump administration, its Republican congressional allies and the right-wingers who want to privatize first the VA hospital system and then the rest of the government, push that type of arbitrary firing, AFGE says. 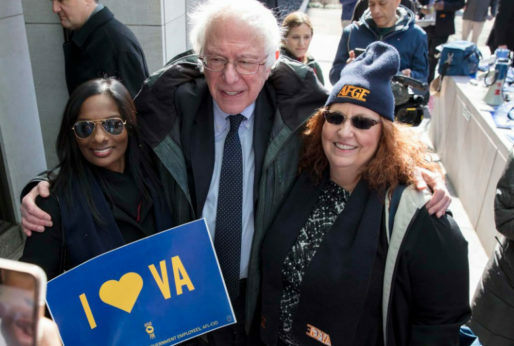 And the Trump-GOP-rightist hatred of federal workers and unions led hundreds of unionists into the streets of D.C. on Feb. 13 and more than 1,000 AFGE members to descend on Congress, too, immediately afterwards, to lobby against the Republicans’ schemes. 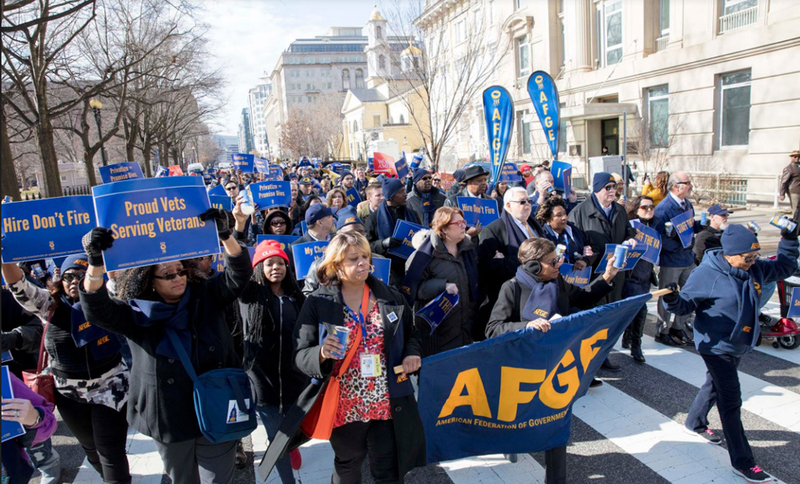 The arbitrary firings and privatization aren’t the only problems the VA faces, and that cause wasn’t the only one AFGE members tackled during their four-day legislative conference in D.C. But it was a big one. Others include staff shortages at VA – estimates range from 27,000-49,000 vacancies – and the law letting vets far from a VA hospital visit private doctors and clinics, with the VA picking up the tab. And still other causes the AFGE conference delegates tackled ranged from a 1,000-worker staff cut at the Bureau of Prisons, which is already short 6,000 correctional officers, to the massive turnover among Transportation Security Officers – the airport screeners – due to low pay, management favoritism and lousy working conditions to countering right wing distortions that federal workers are underworked and overpaid. But at the VA, the GOP-run Congress, even during the Democratic Obama administration, used the excuse of prior VA scandals to impose the arbitrary firing system, with lack of due process for workers, on the agency. And it threw in the subsidies for private docs and clinics, too. In those scandals, VA managers covered up long wait times for vets’ care and rank-and-file VA workers – AFGE members – blew the whistle and then suffered retribution for it. The union had to defend them, just as Conner, a nurse herself, had to defend her colleague. The arbitrary firing law was supposed to let VA’s Secretary oust lying and ineffective top managers. Instead, fewer than two dozen of them have been fired, compared to 1,400-plus rank-and-file workers, many of them women, minorities and making less than $40,000 yearly. “In 2018, the relentless bashing of servicers provided directly by the VA – as opposed to VA contractors who are subject to minimal oversight – and the equally politicized attacks on its dedicated employees are likely to continue” the union’s comprehensive issues book, given to conference delegates, says. The privatizers’ “smear campaign” also masks the fact that VA is accountable to Congress for its treatment of veterans – and the private clinics and doctors aren’t, it adds. How does that work out in practice? “They have this Accountability Act, Conner says of the prior law. It was supposed to get at bad managers, “but in Dallas, we had one manager and 15 workers fired.” And Dallas workers, AFGE members, who blew the whistle on dirty operating rooms at the medical center faced discipline and retribution, she added. The problem could grow worse as privatization grows, said Alma Lee, president of AFGE’s council of VA locals. 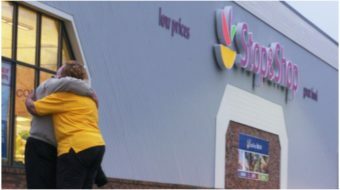 “A private corporation warns only about the bottom line,” she warned. Not only that, but there’s favoritism in hiring, too, Conner said. 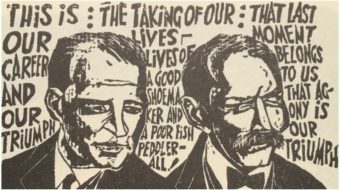 That’s the spoils system AFGE President J. David Cox warned about after Trump proposed giving managers government-wide even more leeway to fire workers without due process of law. “How are they qualified?” she asks. Whether Congress’ ruling Republicans, much less Trump, will heed the VA workers, is dubious. “Forty billion dollars. 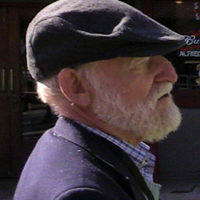 That’s how much Congress wants to spend on privatization” of the VA, said Cox, himself a retired VA psychiatric nurse. Certainly, the Democrats are listening.